Spray 3 1/2- to 4-quart slow cooker with cooking spray. In 12-inch nonstick skillet, cook beef and onion over medium-high heat 8 to 10 minutes, stirring occasionally, until beef is browned; drain. In slow cooker, stir beef mixture and remaining sandwich ingredients except pita breads. Cover; cook on Low heat setting 3 to 4 hours. Meanwhile, in small bowl, stir all sauce ingredients. Cover; refrigerate until serving time. Warm pita breads as directed on package. 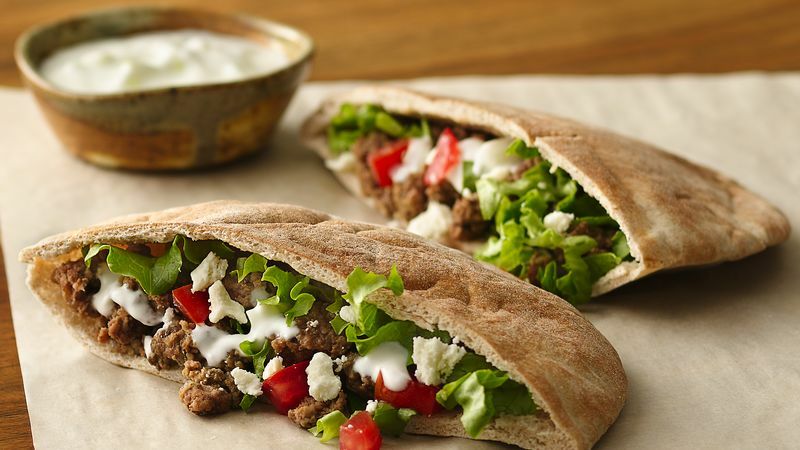 Using slotted spoon, fill each pita half with 3 to 4 tablespoons hot beef mixture; add 1 rounded tablespoon yogurt sauce. Top with tomatoes, lettuce and cheese. Enliven the flavor of the sauce and add even more Greek flavor by stirring in 1 tablespoon chopped fresh mint leaves. Consommé is a clarified broth and is often sold as double strength. If you wish, substitute 1 1/4 cups beef broth or stock for consommé. Both dried and fresh garlic are used in this recipe. Dried minced garlic will produce a more pronounced garlic flavor when slow cooking, while a fresh garlic clove is used to flavor the yogurt sauce. If desired, substitute 4 to 6 garlic cloves, finely chopped, for the dried minced garlic in the beef mixture.